To enable digital transformation using new age technologies, development of new business platforms and products and to leverage FinTech environment, the Bank has constituted “BarodaSun Technologies Limited” as a fully owned subsidiary of Bank. BarodaSun Technologies would be the “IT Centre of Excellence”. We are looking for qualified Specialist IT Professionals at Mumbai and/or Hyderabad on contractual basis, for various positions in our new Subsidiary, who can lead & support by using skills in the area of design thinking, process re-engineering, architectural design, and core software development. 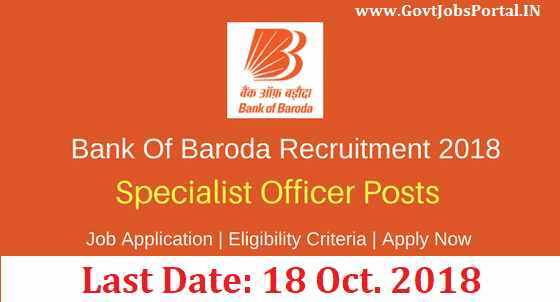 More information related to this BOB Recruitment 2018 is given below in this article. 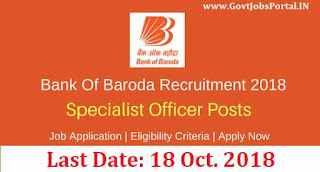 Read the article carefully before applying online for these bank jobs in India 2018. Educational Qualification Required: Those who have completed their Engineering degree(BE/B.Tech) can apply for these Bank jobs in India. Selection will be based on short listing and/or qualifying test and subsequent round of Personal Interview and/or Group Discussion. · Bank/Subsidiary reserves the right to change (cancel/ modify/ add) any of the vacancy, any of the criteria, method of selection and provisional allotment etc. · The Bank/Subsidiary reserves its right to call for test (if required)/ GD/ PI, candidates in a ratio, at its sole discretion. · Adequate candidates as decided by the Bank/subsidiary will be shortlisted based on their qualification, experience and overall suitability for Interview. Most suitable candidates will be called for GD and/or PI and merely applying for the post does not entitle the candidate to be eligible for the selection process. · The qualifying marks in test/Interview will be as decided by the Bank/subsidiary. · A candidate should qualify in all the processes of selection, GD and/or PI (as the case may be) and sufficiently high in the merit to be shortlisted for subsequent process. · In case more than 1 applicant scores the cut off marks (common mark at cut off point), such applicants will be ranked according to their age in descending order. 27TH Sept. 2018 is the Start Date to apply.